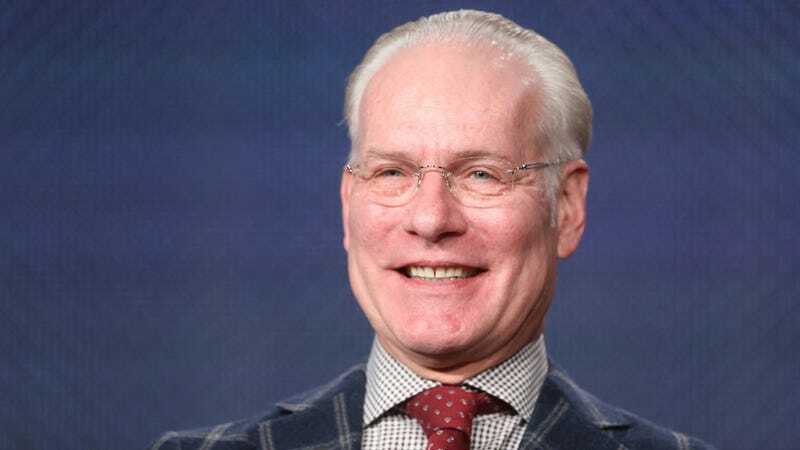 Project Runway mentor Tim Gunn is known for bringing kind, practical and honest criticism to the workroom as frantic, sleep-deprived designers rush to complete nearly-impossible clothing designs. He's also recognized for being one of the nicest people of, well, anything, which is why it's so disappointing that Gunn recently made some pretty ignorant and short-sighted remarks on the inclusion of trans models in runway shows during an interview with The Huffington Post. Initially, Gunn was asked how he felt about the inclusion of models like Andrej Pejic (who is self-described as gender fluid and refers to herself using female pronouns) in women's fashion shows. "The fact that fashion designers would put basically adolescent-shaped boys or men in women's clothes is head-scratching for me because, anatomically, women and men have different shapes, so, to be looking at women's fashion on a tall, skinny guy with no hips, there's no way you can project yourself into those clothes...It underscores all of those body issues that we know women have. It's the world telling us that there's something wrong with us and that we'd look better in our clothes and the world would think us more beautiful if we looked like this. I think it's horrible." Gunn's heart is in the right place, but he's still projecting a pretty black and white (and also inaccurate) view of what men and women's bodies "should" look like. Besides, it's not like people don't develop body insecurities when watching women who were anatomically born women model clothes. Insecurities are for eeeeeeverybody. "I'm conflicted. On one hand, I don't want to say that because you were a man and now you're a woman, you can't be in a women's fashion show. But I feel it's a dicey issue. The fact of the matter is, when you are transgender — if you go, say, male to female — you're not having your pelvis broken and having it expanded surgically. You still have the anatomical bone structure of a man." Gunn's comments also assume that there is just one trans body "type," Mara Keisling, the founding executive director of the National Center for Transgender Equality, tells Salon. "Tim Gunn is talking about a topic that I don't think he knows anything about," says Keisling. "I don't think he understands who trans people are, or about the diversity among trans people. He clearly didn't really look at the Barneys campaign [featuring 17 transgender models], or the diversity of trans models who are already working in the industry." Come on, Gunn. We know you can do better. Make it work.